The French parliament voted Tuesday in favor of a draft law that could, for the first time, make it possible to remove the country’s president from office through a US-style impeachment. The bill, already passed by France’s lower house, was approved by the Senate by 324 votes to 18 and it will now go to France’s Constitutional Council, which must decide if the bill complies with the French constitution, before becoming law. If approved, the law would represent a radical change to the legal status of the French head of state – who has so far enjoyed greater legal protection than almost any other Western leader. Believe it or not, under France’s current constitution, the French president is immune from criminal prosecution during his five-year term and cannot be removed from power except in cases of high treason. Hollande’s unpopularity may be his undoing after all.The new law would not take away the president’s criminal immunity while in office, but would give parliament the power to move for an impeachment in the event of a “breach of his duties patently incompatible with the carrying out of his mandate”. Parliament would have the power to begin the impeachment process through a two-thirds majority vote. 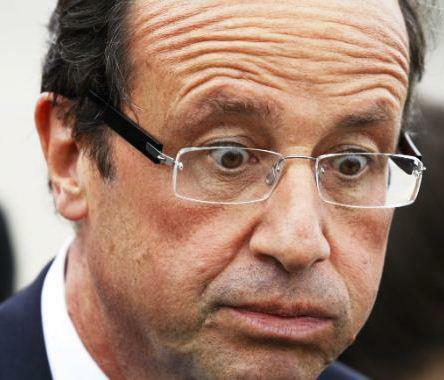 Hollande should just leave while he still has his head.